encouraging healthy lifestyles, building relationships and empowering youth. Steadfast // Reliable. Faithful. True to the End. At Steadfast Community Growers, ​​​it is our goal to grow fresh produce while educating new ways to prepare it so that you can feed it to your loved ones. We are a farm partnership offering weekly shares while mentoring local youth along the way. We believe that relationships are built best by spending time together and learning through hands-on experience and that we should have a good idea of where the food we are putting in our bodies comes from. 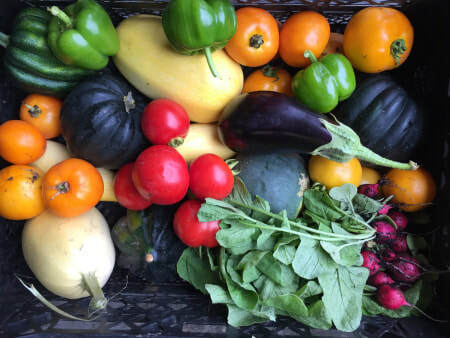 Vriesland Church and Bridge Youth Ministry in Zeeland have a mission to, over time, create working farm and mentorship program that is also educational to our consumers, building community and giving people access to fresh, local and affordable food. We hope to reach youth and adults alike, empowering them to use their talents, and equipping them with skills that will last a lifetime. Welcome to our farm.